Always a great guessing game trying to decipher correctly the needs, wants and desire of any of the 29 other MLB squads for anyone on the Tampa Bay Rays roster. Sure there might be a few GM’s just coming by doing some future window shopping or prod and nudge a bit of the merchandise, but is there really any top shelf Rays that will exit before the end of the Trade Deadline? Can’t be easy time span for a player either with a large contract or even a “ walk” season under their belt until the clock strikes midnight on August 1st. Sure even then deals can still be hashed out, but the large majority of the transactions will be at least attempted in the next few working days. But even the best deal can be stricken down by the might pen of the M L B Commissioner Bud Selig if it seems unfair or has too much cash considerations. So who among the 25 currently rostered Rays players do you think will garner the most attention? Who do you feel will be showcased now for departure in the off season? There are plenty of options, including a few that could either make or break the Rays post season surge. Then again, if the Rays do go into a tailspin over the next few series( Kansas City/Oakland/Toronto), they could instead purge before the last moments in July? Even the Great Kreskin would have a difficult time trying to summarize some of the gossip and whispers currently doing the rounds in the MLB circle. With the emergence of SP Alex Cobb and Rays Manager Joe Maddon staying with a 6-man rotation. Could this be a precursor to a starter leaving town? 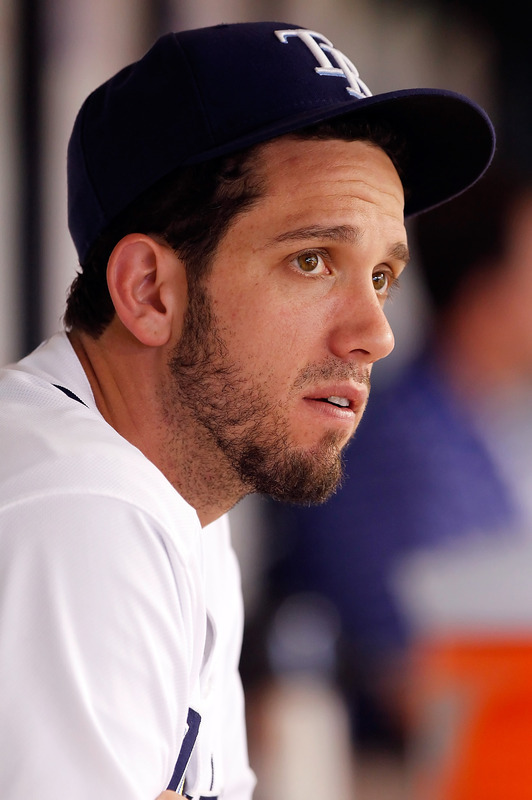 James Shields has reconstructed his delivery and career to a point some teams are eager to get a guy who can push out innings and provide strikeouts. Shields might have de-valued himself a tad during his recent 4-game tailspin. With a team friendly $ 7 million dollar salary for 2012, Shields is still affordable and could be in the plastic bubble until this time in 2012. Do the Rays instead sell high on SP Jeff Niemann while he is on his own hot streak? The Tall Texan might not garner a top tier return, but a few teams do have veterans who might walk after this season, and if they fit into the Rays mold….Niemann could be on a flight by August 1st. With that in mind, why not put SP/RP Andy Sonnanstine on the top shelf to see who wanders by for a long look. Sonny has all the qualities a good team needs with MLB experience, stability and is a solid “company man”. He can be used in a variety of ways, and his tenure with the Rays might be on unstable ground with the emergence of Cobb and others pushing hard to break through the Triple-A ceiling to the majors. Sonny, like Niemann will not collect a bevy of returns, but his shelf life with the Rays might be getting near its expiration point. Cesar Ramos is a southpaw, and with the Rays currently having 3 in their Bullpen, excess might not be the keys to the Rays Bullpen success. He might bring in a better haul than Sonny, but knowing the Rays and their love of the crafty lefties, he might stick. Still, the Rays would not offer up fellow relievers Jake McGee or J P Howell unless the return was something they could not refuse. That brings us to the Rays field players. A few names possibly jump out at you, but one that I truly think is “off limits” is First Baseman Casey Kotchman. The job he has done since he cemented himself at First has been incredible. With only 1 error this season, Kotchman might be tied to this Rays team soon for the next 3 years. I have heard a few whispers in the hallways. In the infield, with the thoughts also swirling that SS Reid Brignac is taking backward steps, this effectively closes any possible discussions on Elliot Johnson or Sean Rodriguez. Their stability will be needed now more than ever, and cutting loose even one of the pair would be disastrous unless an infield MLB caliber upgrade is received. With the recent injuries surrounding the catching position, it might be a hidden blessing for C Kelly Shoppach. Still, the Rays could deal the often offensively maligned backstop for prospects, or maybe even a little cash. The market is not seeking Shoppach with gusto, but a back-up with experience heading into the stressful last months of the season and beyond can be a blessing to a young team. That leaves the outfield has one of the biggest question marks with at least 4 possible Rays players getting a few glances and maybe trade discussions. Still think Desmond Jennings is here to be looked at by not only the Rays, but by 29 other teams. I really think the Rays have a lot of questions about Jennings, and he could be traded for the right package. You might have thought I would thrust B J Upton in the top spot for trade discussion, but I truly think the Rays will keep Upton until the end of the 2011 season, then listen intently to offers. Upton might not be the most attentive player on the bases, but he plays solid defense and has trimmed his swing a bit to be more productive. Who in their right mind thought he would get over 15 Hrs in 2011? Still, with the Washington Nationals eager for Upton, and with names like INF Ian Desmond or RP Drew Storen being put on the end of the pole, the Rays could bite and fill a future hole in their team with young replacements who are starting to show their MLB potentials. Still it is a long shot these names are included with Upton’s’. Then again, Friedman can deliver brilliance with Bull-hockey pucks. The guy who might garner the most outfield attention doesn’t actually play there on a daily basis. 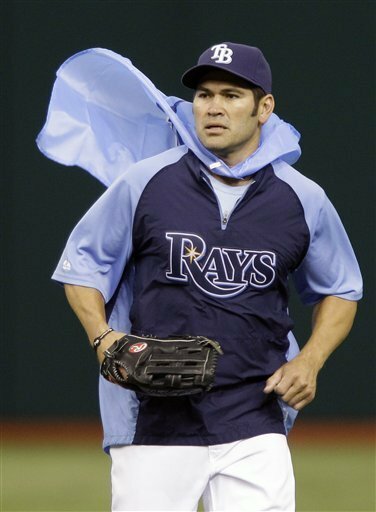 Johnny Damon could bring a nice haul in return from a team on the cusp of contention, or wanting to stay hard in the race until the end. But is he worth the gamble of leaving with the type of offense and ability to help charge up this team with a single swing? You can’t buy that kind of massive production on and off the field this time of year. But if the Rays are truly in a mood to upgrade now, Damon might be the perfect carrot to dangle in front of the MLB herd. There is another player who has emerged to a point his status might be at its zenith, and a downward spiral is definitely in the cards. I think the world of the abilities and freestyle aerial moves of Sam Fuld, but I also know MLB is treating him more like a novelty act right now than a budding star or long producing commodity. Here is another Rays player who might be at the peak of his trade value right now. Combine his on-field heroics with his solid base running and you get a nice threat either off the bench or in the field heading into the post season. There is still the possibilities the Rays just bluff and stay with their current format, but the more realistic approach is someone will go, changes will be made. Upton should be planted in CF until the off season, Shields even though he turns 30 in December is a great anchor for this Rays rotation. That being said, Sonny and Niemann could be on the “watch list” and be the two pitchers most likely to exit stage left. Shoppach could still be dealt even with the Rays catching corp down to their bare knuckles. This is one part of the Rays farm system that seems loaded for bear, and could endure a spell without remorse. Jennings is the Rays top field prospect, and I have a sneaking feeling his up-coming promotion to “The Show” has a hidden agenda. Exposing Jennings to MLB caliber pitching with 10 days left could persuade someone to take a risk or gamble on a guy who might not be considered the best outfielder even on his Triple-A squad. But if the Rays do keep Jennings, Upton better look over his shoulder later in the season. Fuld might be safe, but if his average goes South along with his “Legend”, his time and days will be numbered. Damon is the best Rays commodity right now and might be plucked. But Friedman will not trade him for a “rental” player or even a marginal player or prospects. When you have a guy who is putting up consistent numbers like Damon, the price tag has a few zeros in it, even for the short term. This is the time of the year where guessing, predictions and even off-the-cuff remarks come with a glance from the baseball world. Teams want to chuck, acquire and sometimes streamline for different reasons. The only reasons any of these players might be plucked off the Rays roster is if this team truly thinks they have the horses for a playoff run. Upgrading by trading would be the only reason right now the Rays would open their doors for change.